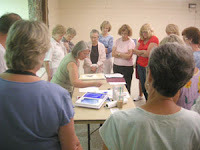 Last weekend I did a workshop for the Brevard Watercolor Society, here in Melbourne, Florida. What a fun time we had! I demonstrated my technique of painting the shadows first, then glazing colors over the dry paint. Lots of people showed up for a fun day of painting! We worked from 10 AM to 2 PM, and I shared as many tips and tricks as I could fit in. My next blog lesson will feature the project we worked on. If you would like to paint along with the lesson, visit my etsy shop (http://watercolorgirl.etsy.com) and for $5.00 I will send you the six page project handouts, including the reference photo and drawing. You will receive these materials in pdf format via email. Thanks to everyone who showed up for the workshop. I really had a great time and I enjoyed many of my new Florida neighbors.